On our last full day in Madrid we hiked from our apartment near the Prado Museum to the Museo Sorolla. It took awhile and we had to ask directions from a parking maid as we got closer. She was amazingly helpful and friendly. She spoke almost no English so we limped along in my rusty Spanish. She pulled out extra paper from her little ticket machine, turned it over, and drew a map! After that we got there with almost no trouble. It’s tricky because the building is the former home and studio of 20th-century painter Joaquin Sorolla (1862-1923) and so it is located right in the middle of a block in a residential section of Madrid. This, of course, makes it very interesting. I always like to have a walk amid the places the real people of a place live. This lovely old home/studio was designed to the artist’s specifications with a huge ceiling of skylights in the studio. There is nothing, afterall, better than natural light for just about any kind of work, but especially for artwork. This whole little jaunt was a serendipitous affair. 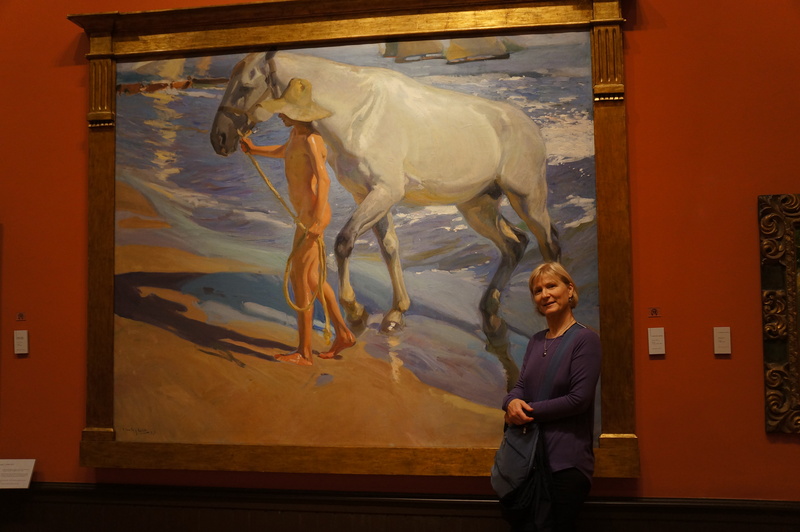 We saw Sorolla’s masterpiece of boys playing in the ocean surf at the Prado. Then we discovered this museum existed here and we decided to go! Often, these jaunts make for the best travel memories/experiences. 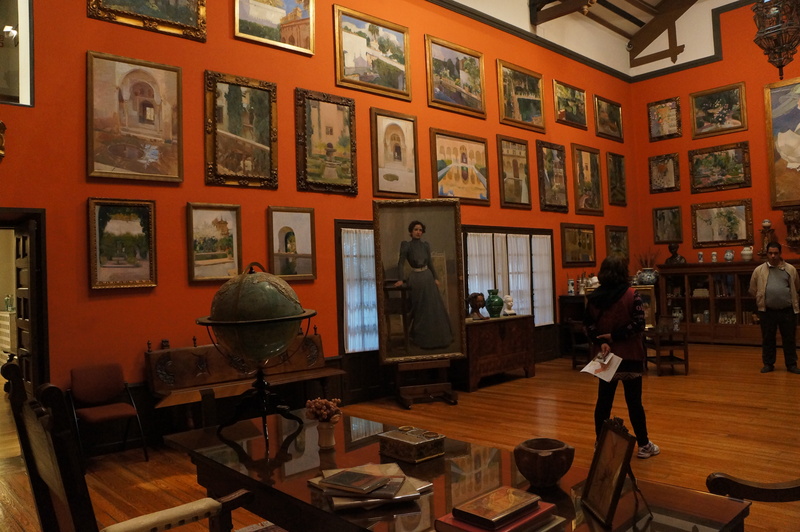 It was wonderful to see so many of his works as well as the home in almost the same condition as when he lived here complete with Tiffany chandelier, sculpture and jars of his paintbrushes. 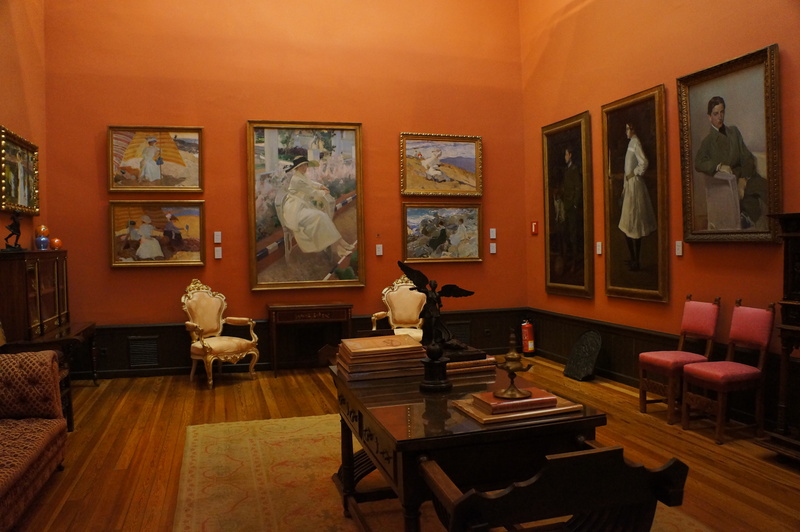 The property became a museum right after Sorolla’s widow’s death so it is very untouched. And the tiny garden is as beautiful as the building itself. I was most fascinated by how he captured light and water in these paintings. There is also a small alcove in the studio where lots and lots of tiny paintings are displayed. I really wanted to come home and experiment with tiny paintings after seeing this. It’s still on the list, but I haven’t gotten there yet.